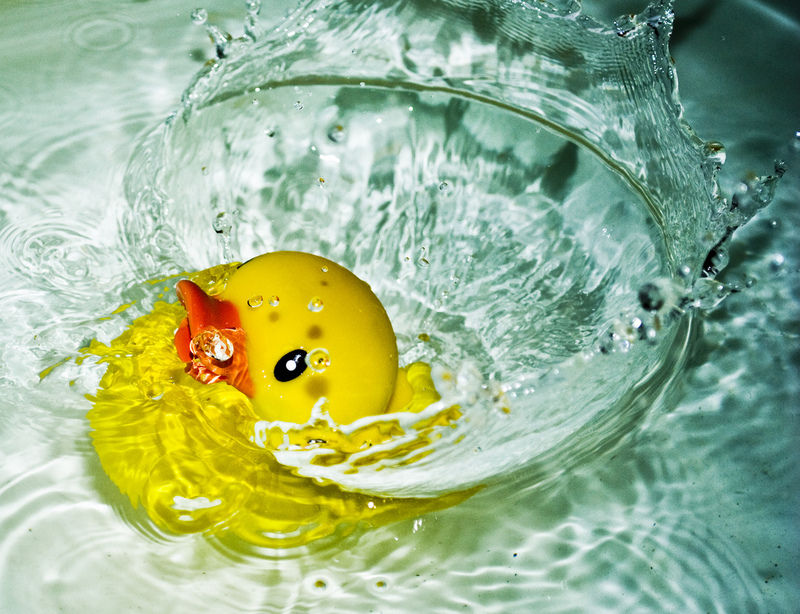 Wave Power Conundrums: Doctor doctor! I see waves before my eyes! Q: If I can see waves being radiated, that's good ... right? We've established that wave energy converters need a radiated wave to cancel out the wave being absorbed. Question is, if you are watching a device operating in a wave tank or a sea trial, and you can see a wave being radiated, does this prove that the device is doing a good job of power capture? Once again, Falnes's wave absorber = wave maker diagram (Fig 2) comes to the rescue. It is clear that the process of destructive inference (Fig 2e) destroys the radiated wave (Fig 2c). Fig 2(e) simply looks like the incident wave has reached the absorber and disappeared, as if by magic. 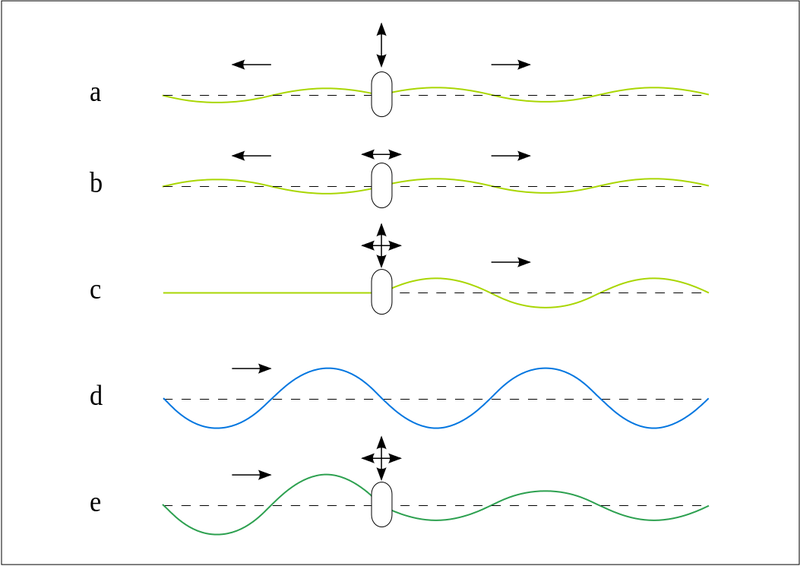 You can't see the radiated wave: that because it's job is to disappear, taking out the captured wave (Fig 2d) in the process. Of course, Fig 2 is not intended to describe real life; it merely describes the requirements for the perfect absorption of a wave. In real life you'd expect imperfections. What would ineffective wave absorption look like? It's worth considering which conditions would result in ineffective wave absorption, and how this might look during operation (in the final step of the diagram). Consider a radiated wave (Fig 3c) with a smaller amplitude than that required for complete absorption (Fig 2c). Some of the incident wave (Fig 3d) would not be cancelled. In the final stage (Fig 3e) it would appear as though some of the incident wave were transmitted (with lower amplitude). The wave carrying energy away from the device is the un-cancelled part of the incident wave. Consider a radiated wave (Fig 4c) with a larger amplitude than that required for complete absorption (Fig 2c). All the incident wave (Fig 4d) would be cancelled, but the remaining un-cancelled radiated wave would carry power away from the system. It would appear (Fig 4e) as though some of the incident wave were transmitted, with the odd appearance of having switched phase: troughs have become crests and vice versa. The wave carrying energy away is wasted radiation; it is over and above that required to capture power. 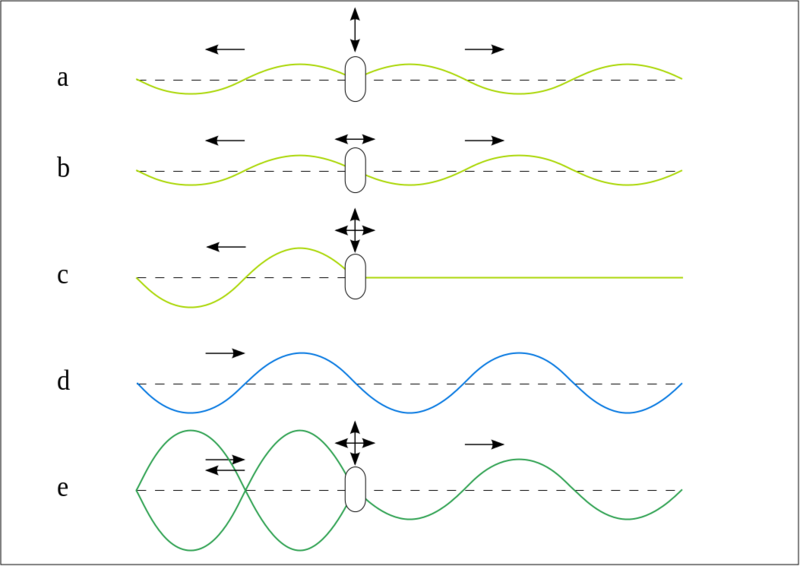 Fig 4 shows the case where the radiated wave has less than twice the amplitude of the incident wave; hence in Fig 4e we see a transmitted wave that is smaller than the incident wave. Conservation of energy tells us some power has been captured. If instead the radiated wave was more than twice as big as the incident wave, we would observe in step (e) a transmitted wave that was larger than the incident wave. Conservation of energy would tell us that we would need to be supplying power to the system rather than capturing it. If the radiated wave (Fig 5c) was ±60º from the optimal phase (Fig 2c) the wave that appears to have been transmitted (Fig 5e) will be out of phase with the incident wave (Fig 5d). It will also have a lower amplitude than the incident wave; hence energy is being captured. At phase angles further away from those required, the interference would be constructive rather than destructive. This means we would observe a transmitted wave with a larger amplitude than the incident wave. Conservation of energy tells us this is possible only if we are putting energy into the system (driving motion). In both cases the wave leaving the system would consist of some un-cancelled incident wave combined with wasted radiation. 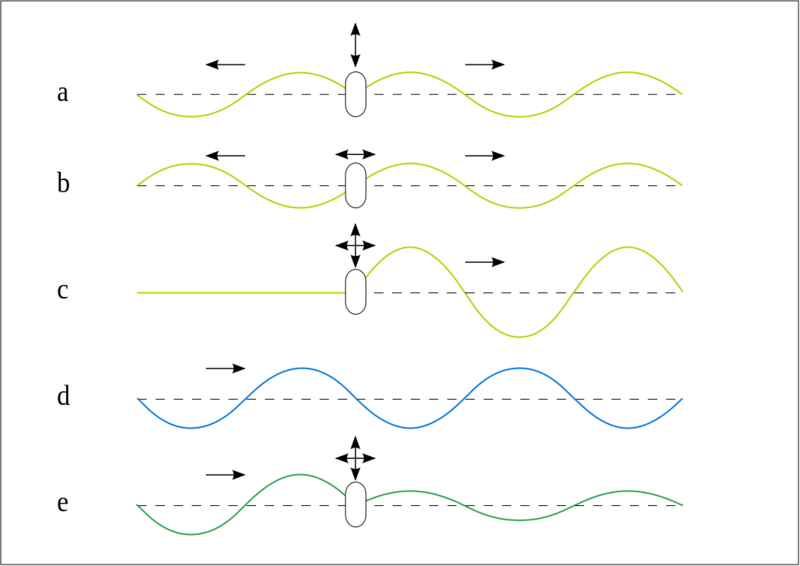 Ahead of the device (Fig 6e), the radiated and incident waves would combine to give a standing wave. Behind the device we'd see the un-cancelled incident wave. Again, conservation of energy tells us that this case is possible only if we are driving the motion rather than damping it. In a previous article I presented a variant of Falnes's diagram that applies to large devices, and discussed why Fig 2 refers to a small device. For large devices, it is necessary to radiate waves towards the incident waves, so waves radiated in the same direction as the incident wave are travelling in 'the wrong direction'. 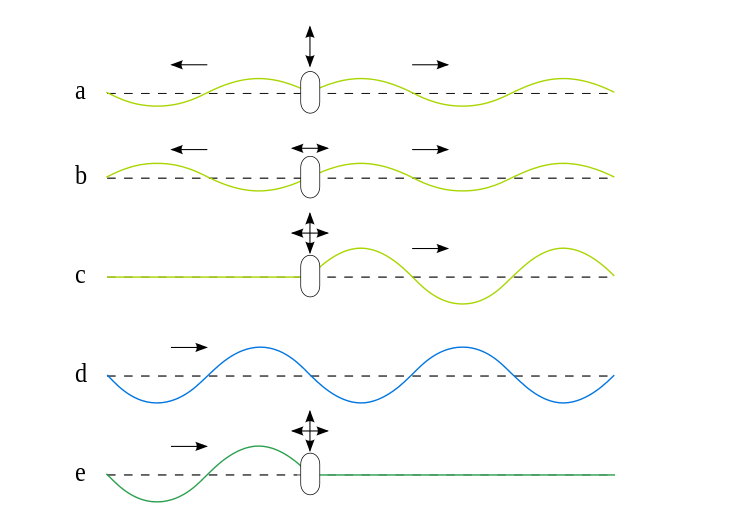 For small devices, it is necessary to radiate waves in the same direction as the incident waves, so waves radiated towards the incident waves (Fig 6c) are travelling in 'the wrong direction'. 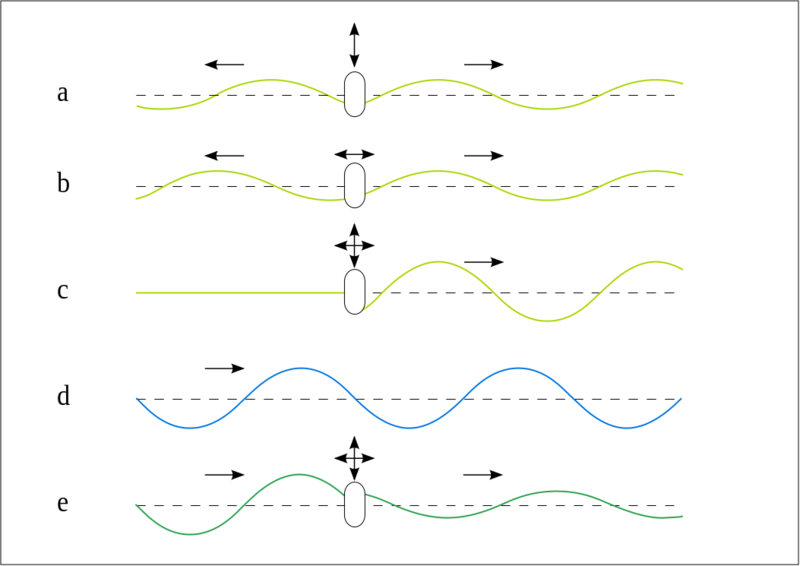 When waves are radiated in the wrong direction, both un-cancelled incident waves and wasted radiated waves are leaving the system. If you are watching a device operating in a wave tank or a sea trial and you can see waves radiating away, this is evidence that the device is not working efficiently. What you're observing is either wasted radiation; radiated waves that are not doing the job of cancelling out the waves you're trying to capture; or waves arising from the incident wave that have not been cancelled by a radiated wave. Both are undesirable, as the power they carry away from the system is power not being captured. Falnes's diagram: just a bunch of maths? Doctor doctor! I had to tie it down to stop it thrashing about! Doctor doctor! Surely radiation can't be good for me?